Ask an English teacher to name the best part of summer break, and it’s likely that one answer will stand out above the rest: time to read! Finally. No essays to grade. No lessons to plan. No copies to run. No parents to call. No faculty meetings to attend. Nothing left to stop us from getting lost in a great book (or a dozen). When friends and colleagues reach out for recommendations, I usually start with The Hate U Give, Long Way Down and all of our Project LIT Book Club selections. However, for those of you who are passionate about increasing book access and improving literacy outcomes among young people, I’d start with this article from The Atlantic, which I recall reading two years ago, almost to the day. A light bulb went off. I thought immediately of my Maplewood High School students in Metro Nashville, avid readers and writers, despite growing up in a book desert, or neighborhood with limited access to books. Why are book deserts harmful? Why do you think book deserts exist? What can we do this year to solve this problem? At this moment, Project LIT Community was born. And over the past two years, our kind, creative, and courageous students have worked tirelessly to not simply eliminate book deserts, but to increase access to high-quality, culturally relevant books and promote a love of reading in schools everywhere. How? One step, one book, and one conversation at time. Project LIT Community empowers young people as readers and leaders, so that they’re prepared to choose their path in life and inspired to change the world. “Project LIT has helped me grow as a person and genuinely changed my perspective on reading,” wrote Kiara, a rising senior and one of our founders. In addition to reading more than 20 books over the past two years, Kiara helps run our chapter’s Twitter account, stars in Project LIT videos, writes letters to community members, authors, and local businesses, designs and promotes Project LIT merchandise, leads our monthly community-wide book club and service events, reads to local elementary students, creates artwork inspired by our novels, and speaks publicly at all Project LIT events. 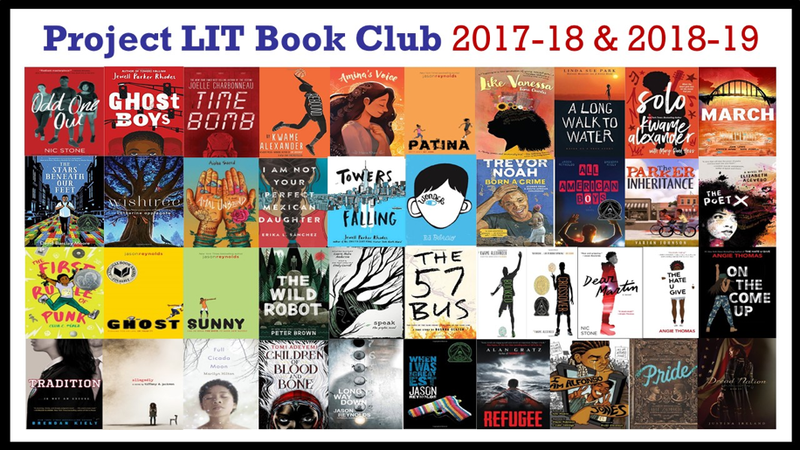 Although Project LIT Community is certainly about books, it is also about belonging. It’s about creating opportunities for Kiara and her classmates to contribute their unique strengths and talents while developing the literacy and leadership skills they’ll continue to apply in college and throughout their lives. If we want our young people to be excited about reading (and we should), then we must be intentional about the texts we include in our classrooms and curriculum. We have to be willing to challenge the status quo and to acknowledge that the way we’ve always done things, particularly in our English classrooms, has not worked for far too many of our students. We have to be willing to listen to our young people and include them in the decision-making process. We have to be willing to block out the noise (there’s a lot of it these days) and remember why we got into the profession. For me, that means providing my students with as many positive literacy experiences as possible and connecting them with books they can’t put down. What began as a class project has become a national grassroots movement that, as of July 2018, includes 400 Project LIT chapters in more than 40 states. 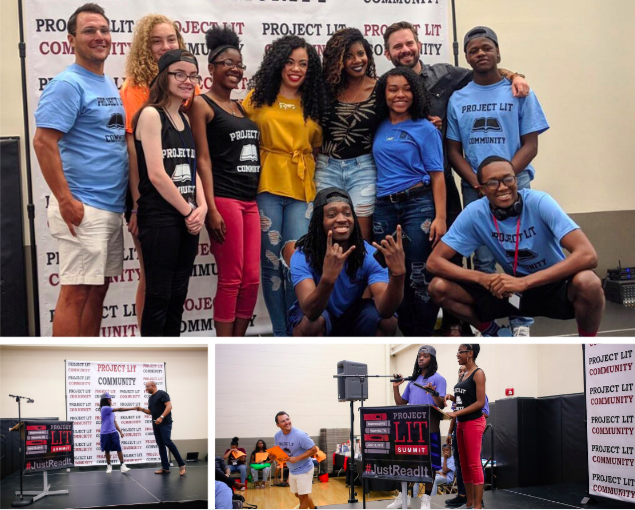 Each chapter is led by a team of passionate students and educators, many of whom convened in Nashville, TN, on June 16, 2018, for the inaugural Project LIT Summit, where they had a chance to hear from Jakaylia, Kiara, and other student leaders, as well as best-selling authors Kwame Alexander, Tiffany Jackson, Nic Stone, and Jeff Zentner. The summit, which included more than 200 attendees from 27 states, allowed educators to learn more about our work, connect and collaborate with fellow chapters, and develop a game plan for the upcoming school year. The best news is that this work is just getting started. We encourage educators to learn more about our community by following us on Twitter (@projectlitcomm) and joining our #ProjectLITchat on Sunday evenings. We also have a Project LIT chapter leader application for those who are interested in joining our team. Ultimately, we’re looking for more educators who believe in the power and potential of our young people, and who are willing to do whatever it takes to ensure that their students have the literacy and leadership opportunities they deserve. Dr. Jarred Amato is a high school English teacher in Nashville, TN, and one of the founders of Project LIT Community, a grassroots literacy movement that empowers students as readers and leaders. An alumnus of the first cohort of Hope Street Group TN Teacher Fellows, he now serves on the organization’s national Teacher Advisory Council. Follow Jarred on Twitter @jarredamato, learn more about his work and the Project LIT Summit at https://jarredamato.wordpress.com/, and/or contact him directly at jarred.amato@gmail.com. Hope Street Group strives to ensure every American has access to economic opportunity.